Similar to the Mississippi Department of Archives and History with its historical marker signs throughout Mississippi, the Tennessee Historical Commission maintains a network of historical markers throughout the State of Tennessee. Here are some Tennessee Historical Commission markers we came across during our travels. We have placed the sites related to music first, followed by other sites which are interesting but unrelated to music. There are only two confirmed photographs of Robert Johnson. 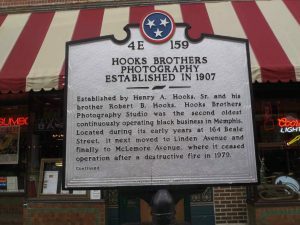 One of them was taken at the Hooks Brothers Photography Studio. Located outside Elvis Presley’s home, Graceland, in Memphis, Tennessee. 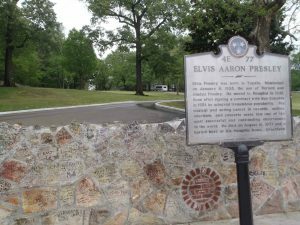 Elvis Presley is buried on the grounds of Graceland. 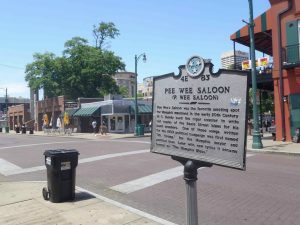 The Pee Wee Saloon is mentioned in W.C. Handy’s autobiography, Father of the Blues, as a meeting place for musicians in early 20th century Memphis. W.C. Handy says he wrote music and lyrics at the cigar counter in Pee Wee Saloon. The Hard Rock Cafe now stands at the Pee Wee Saloon site. 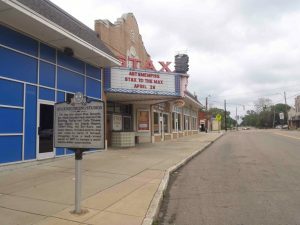 The Stax Museum at this site is a recreation of the original Stax Records building, which was demolished in the 1980’s. 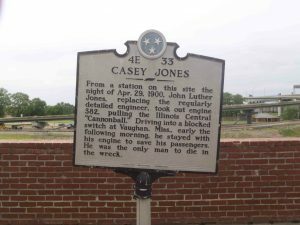 About Casey Jones and the train wreck at Vaughn, Mississippi on 30 April 1900. Blues musicians who have recorded songs about Casey Jones include Furry Lewis and Mississippi John Hurt. 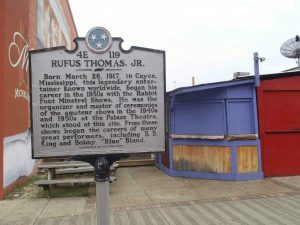 At the site of the former Palace Theatre (demolished in 1972) where Rufus Thomas Jr. was MC during the 1940’s and 1950’s. 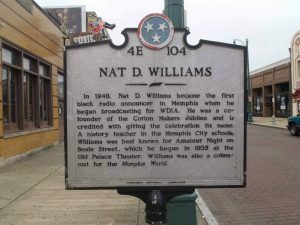 Nat D. Williams was a history teacher in the Memphis public schools who was also a DJ on WDIA, a newspaper columnist and promoter of blues and R&B. In the late 1940’s WDIA was the first Memphis radio station to move to an all black programming format. Although the station ownership was white, all WDIA on air personalities were black. 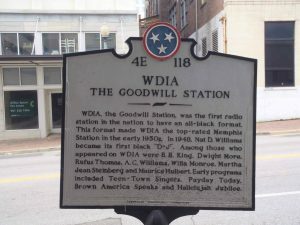 The move to the all black blues and R&B format made WDIA the leading radio station in Memphis. 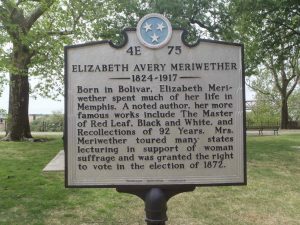 Elizabeth Avery Meriwether (1824-1917) was a noted author and women’s suffrage campaigner.